This is an artistic illustration of the giant planet HR 8799b. 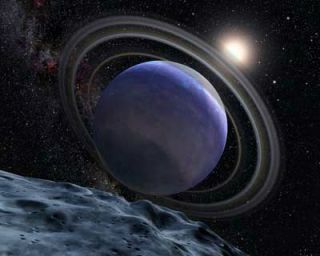 The planet was first discovered in 2007 at the Gemini North observatory. The planet is young and hot, at a temperature of 1500 degrees Fahrenheit. It is slightly larger than Jupiter and may be 10 times more massive. The newstrategy may allow researchers to uncover other distant alien worlds potentiallylurking in over a decade's worth of Hubble archival data. The methodwas used to find an exoplanet that went undetected in Hubble images takenin 1998 with its Near Infrared Camera and Multi-Object Spectrometer (NICMOS). Astronomersknew of the planet's existence from images taken with the Keck and Gemini Northtelescopes in 2007 and 2008, long after Hubble snapped its first picture of thesystem. The planetis estimated to be at least seven times the mass of Jupiter. It is theoutermost of three massive planets known to orbit the dusty young star HR 8799,which is 130 light-years away from Earth. NICMOS could not see the other twoplanets because its coronagraphic spot ? a device that blots out the glare ofthe star ?blocked its viewof the two inner planets. "We?veshown that NICMOS is more powerful than previously thought for imagingplanets," said the scientist who found the planet, David Lafreniere of the University of Toronto in Canada. "Our new image-processing techniqueefficiently subtracts the glare from a star that spills over the coronagraph?sedge, allowing us to see planets that are one-tenth the brightness of whatcould be detected before with Hubble." Taking theimage of an exoplanet is not an easy task. Planets can be billions of timesfainter than the star around which they orbit and are typically located atseparations smaller than 1/2,000th the apparent size of the full moon, as seenfrom Earth, from their star. The planet recovered in the NICMOS data is about100,000 times fainter than the star when viewed in the near-infrared spectrum. Over thelast two decades, scientists have spotted more than 300 extrasolarplanets circling other stars in our Milky Way galaxy. Lafreniereadapted an image reconstruction technique that was first developed forground-based observatories. Using thenew technique, he recovered the planet in NICMOS observations taken 10 yearsbefore the Keck/Gemini discovery. The Hubble picture not only providesimportant confirmation of the planet?s existence, it provides a longer baselinefor demonstrating that the object is in an orbit about the star. "Toget a good determination of the orbit we have to wait a very long time becausethe planet is moving so slowly (it has a 400-year period)," Lafrenieresaid. "The 10-year-old Hubble data take us that much closer to having aprecise measure of the orbit." Hubble isdue to be serviced by a NASA shuttle crew in May for the fifth and final time.The shuttleAtlantis was rolled out for the mission on Tuesday and is due to launch May12. NICMOS?sview provided new insights into the physical characteristics of the planet,too. This was possible because NICMOS works at near-infrared wavelengths thatare severely blocked by Earth?s atmosphere due to absorption by water vapor. "Theplanet seems to be only partially cloud covered and we could be detecting theabsorption of water vapor in the atmosphere," said team member TravisBarman of Lowell Observatory in Flagstaff, Ariz. "Measuring the waterabsorption properties will tell us a great deal about the temperatures andpressures in the atmospheres, in addition to the cloud coverage." With thesuccess of this planet hunt, scientists hope they can find more extrasolarplanets lurking in the enormous catalogue of images that Hubble has taken inits lifetime. "Duringthe past 10 years Hubble has been used to look at over 200 stars withcoronagraphy, looking for planets and disks. We plan to go back and look at allof those archived images and see if anything can be detected that has goneundetected until now," said Christian Marois of the Herzberg Institute ofAstrophysics, Victoria, Canada. If the teamsees a companion object to a star in more than one NICMOS picture, and itappears to have moved along an orbit, follow-up observations will be made withground-based telescopes. If researchers see something once but its brightnessand separation from the star would be reasonable for a planet, they will alsodo follow-up observations with ground-based telescopes. NASA's recently-launchedKepler mission will also be hunting for extrasolar planets in our homegalaxy, though it will be looking for ones that are Earth-sized.